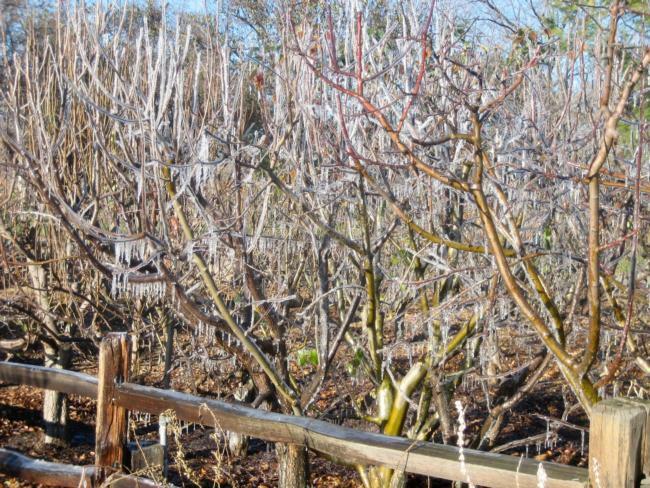 While first and last frost dates are important for gardeners to be aware of, it's also good to know what you can do to prepare for frost and the deal with frost damage after it happens. Frosts or a hard freeze can kill tender plants and can damage citrus, especially young plants so protection is a good idea on those cold, clear winter nights. Place stakes around tender plants and cover with clear plastic or fabric such as a sheet or old drapery. Don't let the material touch the foliage. Wrap larger plants with strings of Christmas tree lights (incandescent bulbs not LEDs) or position a 100–150 watt light in the center of the tree and cover the plant with a sheet. Turn the lights on at night. If plants are potted, move them to a sheltered area such as a porch, under the eaves on the south side of the house or even under a tree. Be sure to uncover them during the day. Moving them indoors to a cool room would be good if possible. Frost injury to plants depends upon a number of factors, including species, age, health, soil moisture, and location. Frost injures plants by causing ice crystals to form in plant cells, making water unavailable to plant tissues and disrupting the movement of fluids. Frost-damaged leaves appear water-soaked, wither, and turn dark brown or black. As much as you might want to remove frost-damaged branches right away, it's important to wait until spring. Early pruning can lead to further dieback along stems and branches because the dead material helps protect the plant from further damage. In addition, spring growth helps you assess the amount of damage, making the extent of damage clear to see.